Originally, this week was slated to feature a review of the radio series, I Was a Communist for the FBI. However due to the passing of Leonard Nimoy, I’ve opted for something a little different my radio of the radio version of I Was a Communist for the FBI appears next week. Leonard Nimoy recently passed away. He’s best known for playing the role of Mr. Spock. He played the character in Eighty Episodes of the original 1960s TV series, eight movies, a guest appearance on Star Trek: The Next Generation, and he voiced the character in twenty-two episodes of the animated series. Yet, Nimoy’s sixty year career was more than sixty year as actor, director, producer, and writer went far beyond a single role. As an actor, he was among the best of his time. This is well-illustrated in the 1973 Telefilm, A Stitch in Crime in which Nimoy plays Doctor Barry Mayfield, an ambitious heart surgeons who is partnered with an older doctor (Will Geer) in a research project. He performs surgery on his partner but Nurse Sharon Martin (Anne Francis) becomes suspicious and makes some calls and plans to discuss her concern. Before she can, Doctor Mayfield murders her in the Hospital parking lot. There’s so much that makes the film work. The music is great and at no time is it better than in the murder scene, as it adds to the suspense. Hy Averback’s directing is flawless with him taking advantage of every minute of the 70+ minute screen time. The supporting cast is among the best Columbo ever had. Golden Globe actress Anne Francis was a great choice to play Sharon Martin, as the character was someone we really sympathized with which isn’t always the case with Columbo victims. And to add to our sense of sympathy, Doctor Mayfield’s partner Doctor Hidemann is played by none other than the actor who played Grandpa Walton. The story also had a bit of mystery as to what Mayfield’s endgame was. We had a sense early on based on Nurse Martin’s reaction that it was something sinister involving Doctor Hidemann but we don’t learn what until the final fifteen minutes. 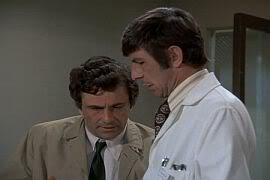 However, the key strength of Columbo is the interaction between the detective and the murderer. There’s a rhythm to it much like a dance and that dance was never more perfectly executed than in A Stitch in Crime. Columbo begins as usual with friendliness and a bit of a comic and sloppy presence, perhaps even more so as he’s eating at the crime scene and has a cold. Doctor Mayfield is similarly polite and helpful, at one point helping Columbo with his cold and writing him a prescription for medicine. I once thought this was a goof as what Doctor writes a prescription to someone they didn’t formally examine and whose history they don’t know? Now, I tend to think of it as a sign of arrogance. And arrogance defines Mayfield as a character. Nimoy’s portrayal combines that with the cool headedness of a surgeon and Mayfield easily becomes one of Columbo’s most sinister opponents. Only one Columbo killer looked more sinister than Nimoy did in the moment before Sharon Martin was killed. (Rip Torn in “Death Hits the Jackpot”) and his coolness throughout makes him more intimidating. Ultimately, when Columbo learns Doctor Hidemann’s life is at risk, he confronts Mayfield and when Mayfield begins laughing at him, Columbo has one of his few bursts of anger as he slams a carafe of water down and accuses Mayfield of murder. The only thing that surpasses that moment is the end of the episode. It’s more typical for Columbo to spend several minutes exposing the murderer in grand style. However in A Stitch in Crime, Columbo nearly failed. Columbo’s final gambit appears to fail and he concedes to Mayfield and walks away. The surgeon showing signs of relief. It appears the murderer has won until the final minute when Columbo returns and we find that Mayfield’s calm demeanor proved to be his undoing. The ending is a great payoff for what I think is Columbo’s greatest episode. It was an episode that knew when to follow the formula the series was already becoming famous for and when to diverge. It featured two fine actors who were used to their full potential to create an episode that stands out even in a series that was full of great episodes.